Gupteswar is a famous cave shrine of Lord Shiva. It is located at the top of a limestone hill named Badudi Hill which is about 500 meters above sea level. The place is surrounded by a dense forest of Sal trees and flanked by Kolab river, and Sabari River, a 2 m high Shiva Linga stands in the cave since unknown times means it is created from nature locally says Patal Futa. The shrine is called Gupteswar which means the ' Lord Siva of Hidden Place.'. It is so named because it was lying hidden in the cave up to 1665 for a very long period. History: In 1665 the King of Jeypur State Maharaj Sri Bikram Dev was got a Order from Lord Shiva in dream to find out the Hidden Place where the Lord Shiva was established. Then King started searching all forests and hills there around and got the Holly Shrine in a cave and started worshiping since then. The Great Maha Shiva Ratri is being celebrating every year. One can reach it by climbing the 1000 steps flanked with rows of champaka trees. The entrance of the cave is about 3m wide and 2 m in height. There are also several other caves nearby. Inside the second cave there is a large statue called Kali Gai (Black Cow) some people worship it as Kamadhenu the divine cow means who fulfills any wills of devotees, One have to wait there with outstretched palms under the Panha of Kali Gai to collect drops of water which fall only at long intervals and getting a drop of water from Kali Gai is the bestow of God to be blessed with all happiness and prosperity. The Place is popular with the name of Gupteswar or as Gupta Kedar in the vicinity, this holly place is endowed with unusual panoramic natural beauty, and is associated with Shri Ramachandra the great hero of the epic Ramayana. According to mythology, the linga was first discovered by Lord Ram when he was roaming in the then Dandakaryana forest with wife Sita and brother Laxman and later worshipped it calling it Gupteswar. The poet Kalidas too, described the scenic beauty of Ramgiri forest where the cave temple is referred to in his famous ‘Meghadutta'. 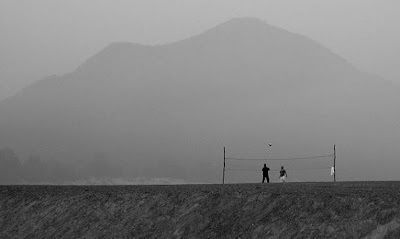 The nearby hill has been named "RAMAGIRI. However, with the passing of time, the temple was unused since the King Sri Bikram Dev searching to get it. Lingam was being worshipped by the tribes of Koraput region. During Shivaratri Celebration Gupteswar Temple draws over 200.000 devotees from Andhra Pradesh, Orissa and Chattisgarh. 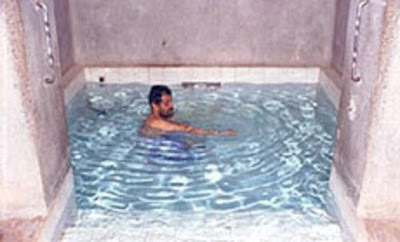 People suffering from incurable diseases come here to worship the god and remain here for months in the hope of getting cured. Other Attraction Places: Never forget to see the near by places, which are also having great value for your visit Gupteswar. Paravadi: Paravadi means Para: Pigeons and Vadi: Rack means the Rack for Pigeons. Where you can find thousands of Pigeons of different color living there and popular folklore is that the Pigeons living there are having a great moral and religious value in their behavior. And it is also believed that some of pigeons are living since the mythological age. 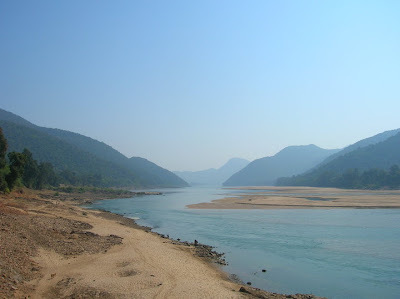 Sabari River: Sabari means the feminine word of Sabara the local name of Tribal people and called so in Oriya. The ever floated River Sabari floating in high stone base gives most attraction with fear. Children’s Park: A children’s Park is maintained there for visitors. Medicinal Garden: A Garden is maintained there with thousands of species of Rare Medicinal Plants and it is a better place to recognize some rare Plants there. Tiger Cave: Out of many caves a cave is named Tiger Cave where tigers were living then. 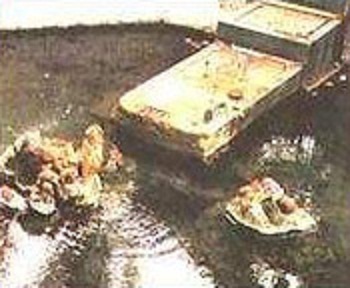 Rama Kunda and Sita Kunda: During Rama Banabasa Sri Ramachandra and Devi Sita and brother Laxman was living in Ramagiri Hill for Months and Sri Rama and Devi Sita was bathing there to worship Lord Shiva in separate ponds now they called so Rama Kunda and Sita Kunda. Rama Pada , Hati Pada, and so many caves are there to visit. How to Reach: It will be about 50 K.M from Jeypur. One can find the way to Gupteswar at Ramagiri on the way to Baipariguda from Jeypur. As the Jeypur and Koraput are connected with National High Way and Indian Railways from Vijaya Nagarm in Andhra Pradesh you can reach there in either means. And you can find Night Bus Services from Bhubaneswar to Koraput and Jeypur and even upto Baipariguda on the way to Malkanagiri. 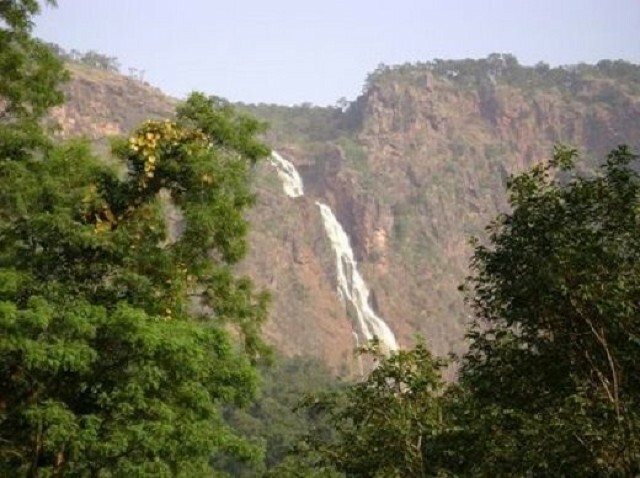 You can find Taxi service and Lodgging and broading facility at Jeypur and Koraput to visit the Places around Koraput. 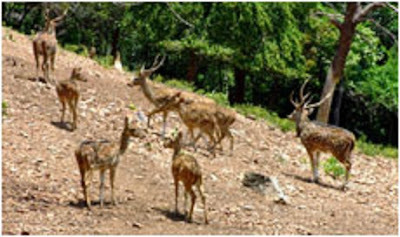 Tikarapada Reserve Forest Or Satakosia Wild Life Sanctuary a Nature Tent for all visitor love to be in Lap of Nature and to feel excitiment with Wild Lives. The beauty and panaromic view of the High Hills around with Deep Forest and Wide Sand beach of River Mahanadi will attract you to stay for another day there in the Nature Tent. You will find picnicer and visitors there starting from the Pampasar Gate up to Tikarapada On Mahanadi River. 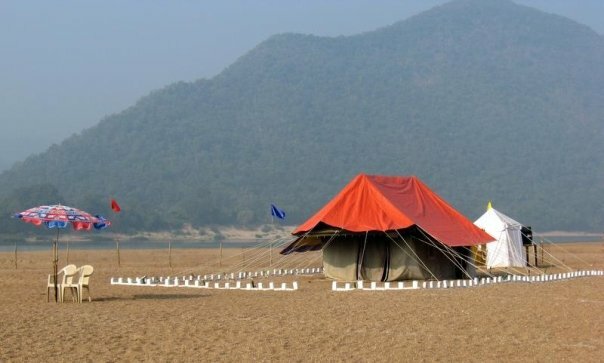 You will find Tents on sands of the River Bank as a fascility by Satakosia Wild Life Forest Division for Visitors. Big Umbrellas with Tables and Chairs like Five Star Hotels or Resorts are being provided there to enjoy the beauty of the nature. Where you can stay with prior permission of the Forest Department. The Tents providing water and solar light fascility with beds for Two people will offer you scenic delights of the wildlife at its best in both day and night. 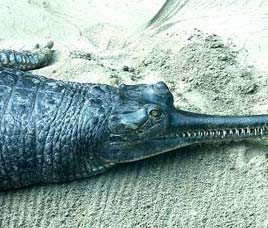 The Gharial crocodile sanctuary, situated there on the bank of Mahanadi River and caring habbits of the local people will also be remeberable and tempting. The blue water of Satkosia Gorge and boating in river will show you Tortoise and different water birds with their natural living style. If you are brave enough to trekk around or as an environmentalists or as a photographer then you will not return with a empty hand or mind.You may find as an ideal place for you to practice river rafting and fishing. Travel in this natural environment and experience the call of the wild at every nook and corner of the forest. Satakosia Wild life Sanctuary Binkey near to Tikarapada a beautiful nature habitat. Large sand of River bed bounded with high hills and serpent water body will enchant U at Tikarapada Wild Life sanctuary area. You Can Catch the sound of the predators, and your chance to watch the elephant, tiger, leopard, Sambar, Gaur, Spotted dear, Poisoned Snakes if you trekk. You can hear high pitched voices of the tribal clans singing from the adjoining village, renders it all the more natural and mystical. Load your backpack with dry foods, mosquito repellents and drinking water and make your way towards the depths of the forest. Keep alert lookout for antelopes, as they vanish in a fraction of a second before you could actually catch a glimpse of them.The swamp water of the lake provides a perfect breeding ground for these reptiles. If You move in deeper in the jungle, you may witness a lone Crested Serpent Eagle gliding in lazy circles, searching for its prey. Or a Hornbills rising suddenly from a tall tree. A beautiful Racket Drongo streaks through the path, its black tail trailing behind. It's a sheer feast for the eyes. The best part of this Forest is the old world charm that it has preserved. How to Reach: How to Reach: Tikarapada is in west-south direction of Angul Town of Orissa and it will be about 45 KM away. If you count from Bhubaneswar it is about 205 K.M. You may reach to the spot hiring a Car or by Pvt. Bus from Angul as it is well connected in road and rail and is situated on the National High Way which is connecting Bhubaneswar to Sambalapur.If You are visiting from Berhampur then Charichakka a Sqaure of State High Way connecting Bhubaneswar- Balangir- Berhampur, where you can find a Car or Trekker for visiting the Place but you have to cross the river Mahanadi from south to north. You have to call loudly to call a boat man from other side of the river. Visit Thengo Dam a beautiful Picnic Spot in Sonepur District of Orissa .Odisha to have a feel of healthy natural environment. Thenga Dam Site : A famous Picnic spot in Sonepur district is Thengo Dam Site of Birmaharajpur Block on Harihara Jora Irrigation Project. The Dame site is attracting thousands of local visitors around the year to have a picnic there under the natural and beautiful environment around. The spectacular water body in foot of the hills and deep forest with cool environment will give you a touch of nature. You can rent a wooden boat with boatman for boating in there. You can also see and feel the charming sound of different species of birds including peacock there in the jungle. Some times in winter you can also find the foreign birds there that are in migration to Chilika Lake. Some times there is also possibility of seeing an elephant, bear or a wolf there in the jungle at the Dam Site. A picnic under the deep shadow of the Jungle will never be erased from your brain if visited. 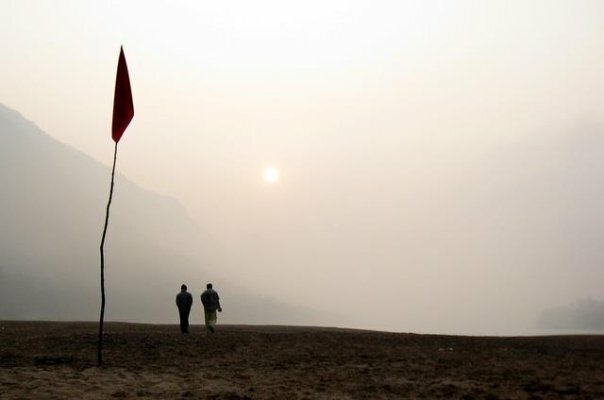 How to Visit : It is will be 35 Km away from Sonepur the District Head Quarter in North direction via Dharmasala on bank of River Mahanadi, Kotasamalai famous for Patali Srikhetra and Jaloi. One can visit from Sambalapur it will be about 90 KM away in east direction via, Dhanupali Chaka of Sambalapur, Huma famous place for Tilted Temple of Lord Siva, and Goddes Metakani on the way to Ulunda, Dharmasala. In other way one from Deogarh or Angul can visit from NH 42 at Charmal or Motibahal Chaka. You can stay at Sonepur to visit other near by famous spots and temples in the district. How to Reach: Saptasajya is in west-south direction of Dhenkanal Town of Orissa and it will be about 20 KM away. If you count from Bhubaneswar it is about 100 K.M. You may reach to the spot hiring a Car from Dhenkanal as Dhenkanal is well connected in road and rail and is situated on the National High Way which is connecting Bhubaneswar to Sambalapur. Pick Time: December to February is Pick period for Picnicker. Unprecedented flow of people happens during that period. Schools, Colleges especially engineering colleges from the state and outside of the state come to have a Picnic here. Saptasajya means Sapta: Seven, Sajya : Bed, means Seven Beds of Bhagwan Bishnu, here the beauty and panoramic view or you may say lap of Nature composing of seven mountain beds including several cascading streams flowing from hill tops, cackle of birds and streams, healthy smell of earth with smell of flowers and buds of medicinal plant. Once you reached the Saptasajya Hill, you will be attracted to so many thing you never seen or never heard. You may trek the uphill across many small stream flowing down. One Temple of Lord Siva is there and you will not find any bazaar or market for getting your liking foods so you must be adjusted to available foods or snacks or you may take your prepared food or you may be prepared for a picnic there as most of visitors came here to have a picnic. You can find another small Shiv Ling near above to this temple, passing through lush green forest and bushes of wild flowers and an Ashram on the top where a Sadhu or Monk is dwelling and Practising dhyan . You will feel... So cool...thick forest all around...sound of the streams mixed with the chirping sound of Cuckoos. And the most beautiful part --- the Stream is flowing down to directly falling on the Shiv Linga, on the rock base and no temple is constructed there. 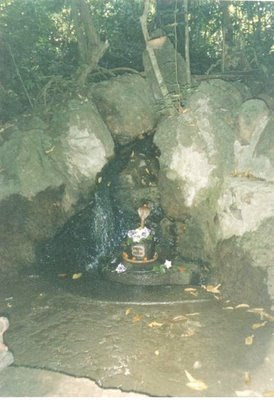 You will find the mouth of the stream coming out from below a rock Just 10 ft above the Siva Ling. A Folklore you may hear, there are some caves above this place of the mountain where only the priest of the Saptasajya can go as Shiv Bhagwan himself stays in those caves guarded by Tigers…Another is that Pandavas of Mahabharat had rested here for some time…when they were in Banabasa.Enjoy your Leisure at SaptaSajya! Have a Picnic! Find a way to express your love to a beloved one with a Red Rose there!